How does a diabetic tiger train for a marathon world record? 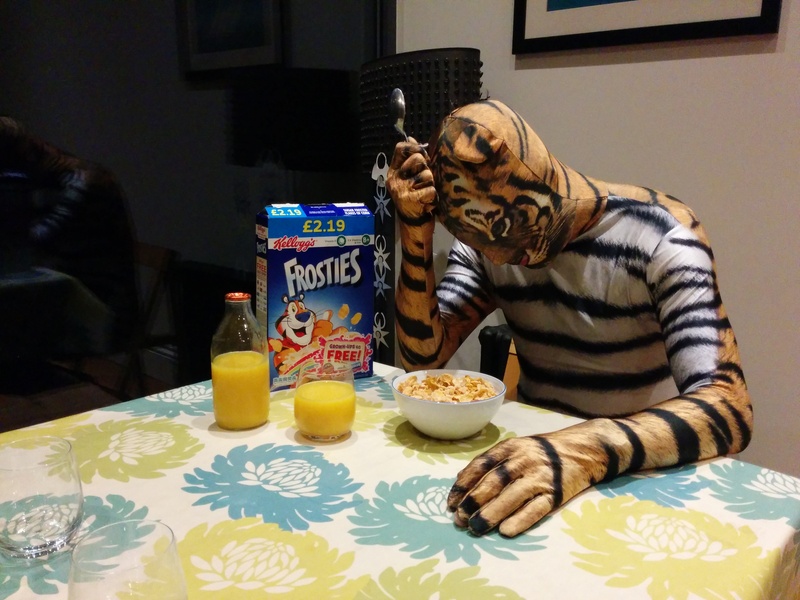 Frosties is a third sugar and drinking orange juice is like drinking coca cola. Not suitable for diabetic tigers! Not all tigers were created equal. Some are diabetic. Some don’t like lazing around and like running long distances instead. So how does this tiger train for the breaking the Guinness World Record for the fastest ever marathon in an animal costume? Does doing A LOT of running help blood sugar control? 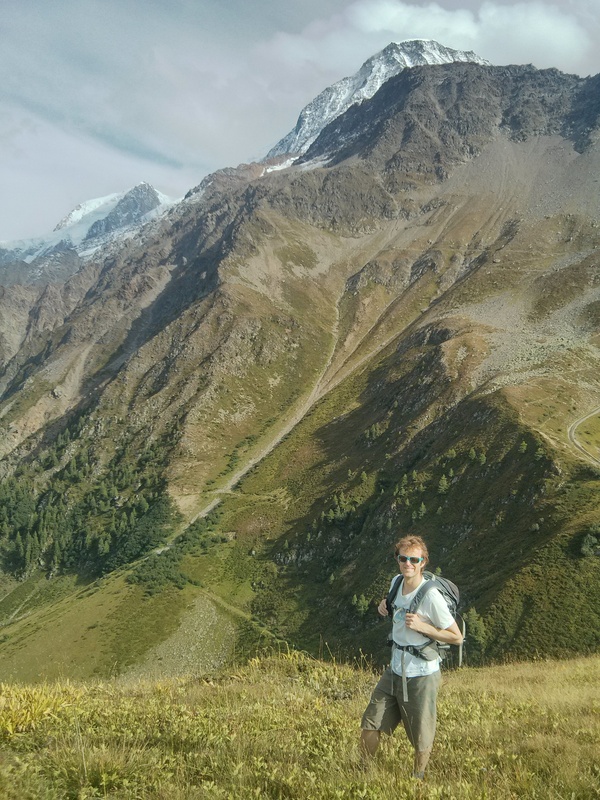 This is where it all started – running in Chamonix in September made me want to do an ultra marathon in Chamonix. 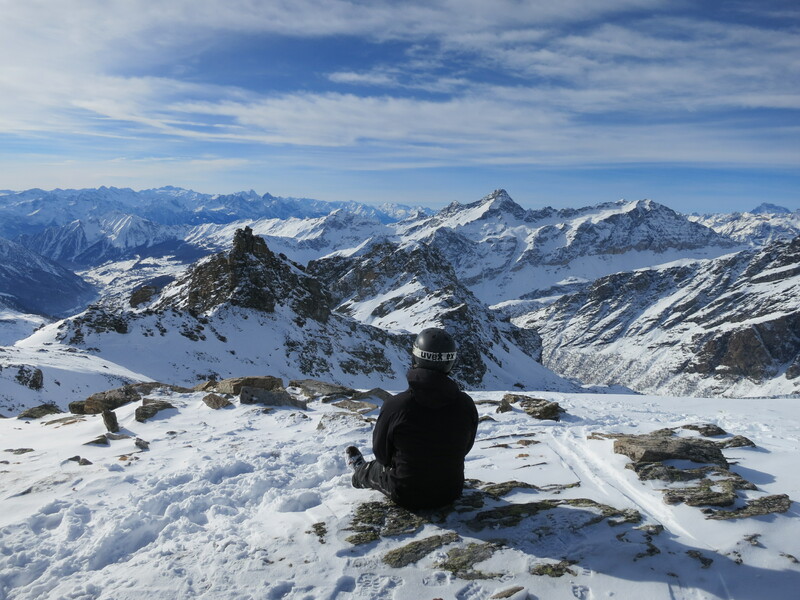 I found out yesterday that I have a place in the CCC – a 100km race from Courmayeur in Italy to Chamonix. It includes 7500m of vertical height difference. I’m still in the honeymoon phase. That means my body produces a small amount of its own insulin and is therefore capable of controlling my blood sugar to some extent. In theory, if I was sensitive enough to this insulin, could my body control its sugar levels like a healthy person? Who knows! 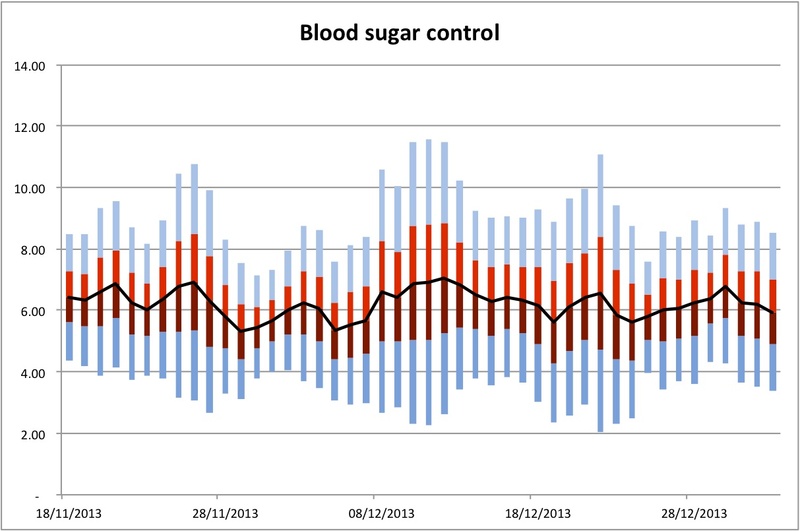 For a few weeks before Christmas, I was consistently waking up with blood glucose readings of between 5 and 6 mmol/litre. That is basically PERFECT. It’s what a healthy person would wake up with. I started noticing that, and I also noticed that it was often 5.7 regardless of what level it was when I went to bed. Over the past month it’s been between 6 and 7 when I wake up. That’s still good, but not PERFECT. I’ve noticed the change in trend and want to know why. 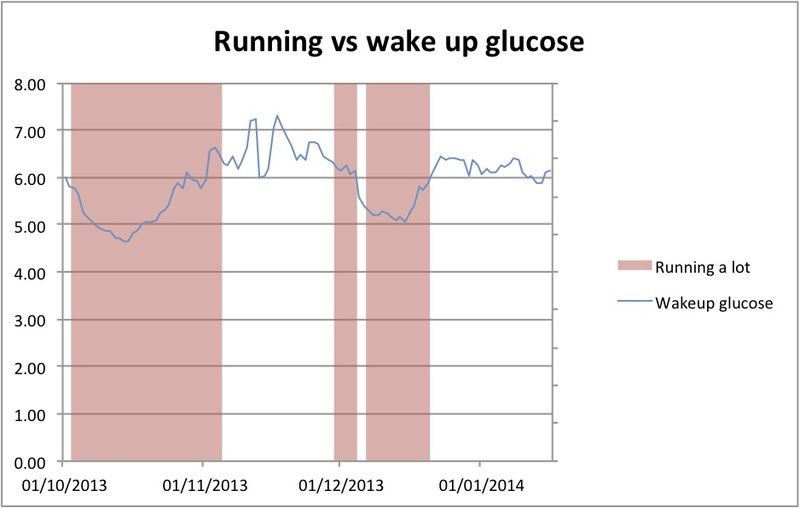 The blue line in the chart above shows my average waking up glucose. You can see a golden period before Christmas, where average waking up glucose was about five despite average glucose when I went to bed (red line) being higher. 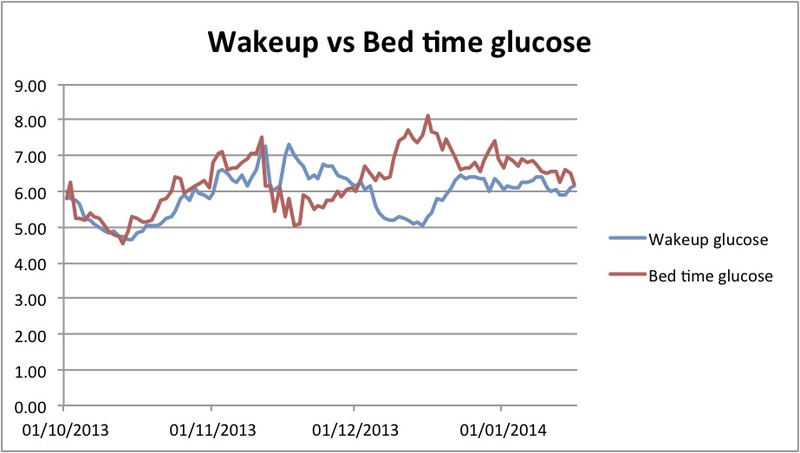 For the rest of the time, glucose on waking is pretty well correlated to glucose when I went to sleep. This suggests that my long acting insulin (Lantus – I take it before bed and it acts like “background” insulin, staying in my system for 24 hours or more) dose is about right. What explains the really good waking glucose levels, and what explains them not being quite as good now? Please forgive the very busy chart below – it shows average waking and bed time glucose, how many minutes of running I did a day on average and average grams of carbs I eat before bed. My Lantus dose has been steadily dropping as I seem to become more sensitive to insulin over time. (You can see I took it down to just four units while I was skiing, but it’s back up to 5 now.) 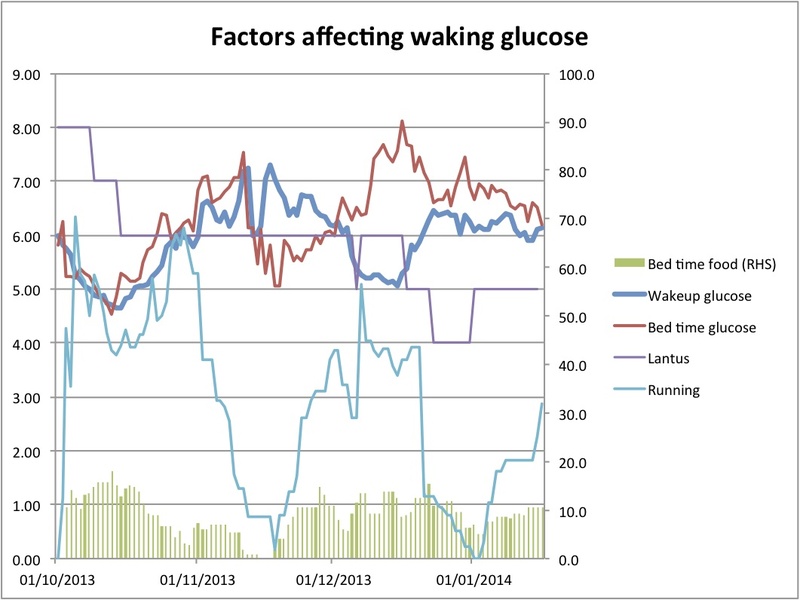 There’s no obvious correlation between Lantus dose and waking blood sugar. If my blood sugar is a bit low when I go to bed, I normally eat something so that I don’t get a hypo. Am I eating more before bed now than I was? You can see from the chart that the opposite is actually true – I was eating slightly more before bed at the same time as my waking blood sugar was best controlled. Could it be the running? The other line on the chart is the number of minutes I’ve run a day, on average. 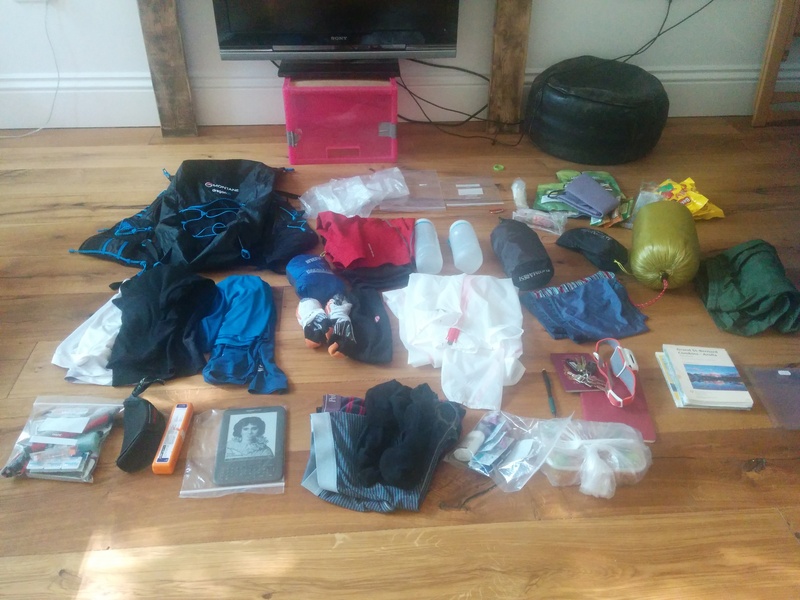 In the lead up to my ultra, I was doing a lot of running (between 50 and 70 miles a week, or over 40 minutes a day on average). I wonder if doing all this running makes my body sensitive enough to insulin to enable my own insulin production to control my blood glucose to the optimal level? I’m going to ask my doctor. The chart below shows my waking blood glucose, with periods where I’ve done over 35 minutes a day of running on average. You can see that there’s a rough correlation between waking with blood sugar of between 5 and 6 and me doing lots of running. I’m ramping up my running training again ahead of the London Marathon. I managed ten miles yesterday, 14 today and hopefully will do eight tomorrow. I’ll continue to monitor my waking glucose (of course!) and will be interested to see whether it starts coming in between 5 and 6 again. I feel great to be running a lot again, and if it helps control my blood sugar better then that’s a nice bonus!